To add your own exercises open the MY Exercises tab and click “+ New Exercise” in the upper right corner of the box. From here you will be prompted to create a name for your exercise. You can change this later if needed. You will then see an exercise window. The ‘Exercise Steps’ tab is selected by default. Click “ + Add Step” to add an exercise step. You can then fill write out the first step of your custom exercise. You can add as many steps as needed. Each step will be displayed separately on your patient’s app. To add a picture to each step simply click the “Upload Photo” button to the right of the exercise text field. You can upload a jpeg or png image. When you are finished click “Save”. You can also specify a thumbnail image for each exercise. Simply click on the image you want to represent the exercise from the exercise picture towards the right of the screen. The image you set as the thumbnail will be displayed in the exercise library for your reference as well as the on the app along with the exercise title for your patient to see. To add a video select the “Video” tab at the top of the exercise window. From the video tab select the “Upload Video” button. You will be prompted to select a video file from your computer. The selected file is displayed on the bottom left of the screen. To change the video simply select “Choose File” and select another video to upload. To maintain quality, video should be at least 800×450. Videos larger than 960×540 will be sized down. Video clips should be under 60 seconds and upload is limited to 50MB. You can also specify the type of exercise, as well as the target body region for your exercise. 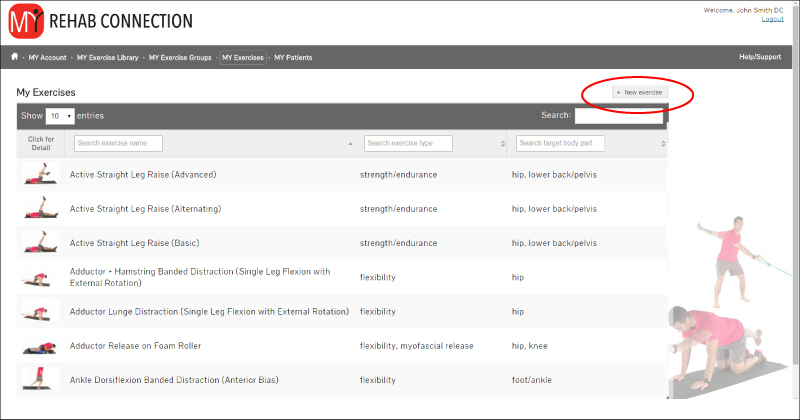 Adding these features will help when searching for exercises when assigning exercises to your patients. 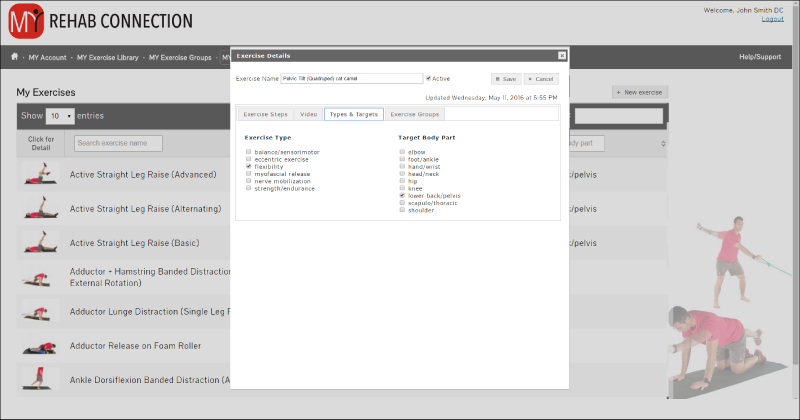 Click on the Types & Targets tab to open the window and select. You can specify the following exercise ‘types’ and ‘target’ body groups.